There are nights when it is really quiet and the stillness seems to underline the silence. No wind, no cries of the nightbirds, no boats easing in and out of the bay. On those nights if you sit under the fig trees, cross-legged and settled, you are hidden. The trees are hundreds of years old, tall and wide as two storey houses that would cost over a million dollars to buy. Their canopies stretch out and out as if they seek to cover the earth, right over the water now, so fearless that nothing can stop them. If you stay hidden and hold your breath a bit you can spot ghosts. 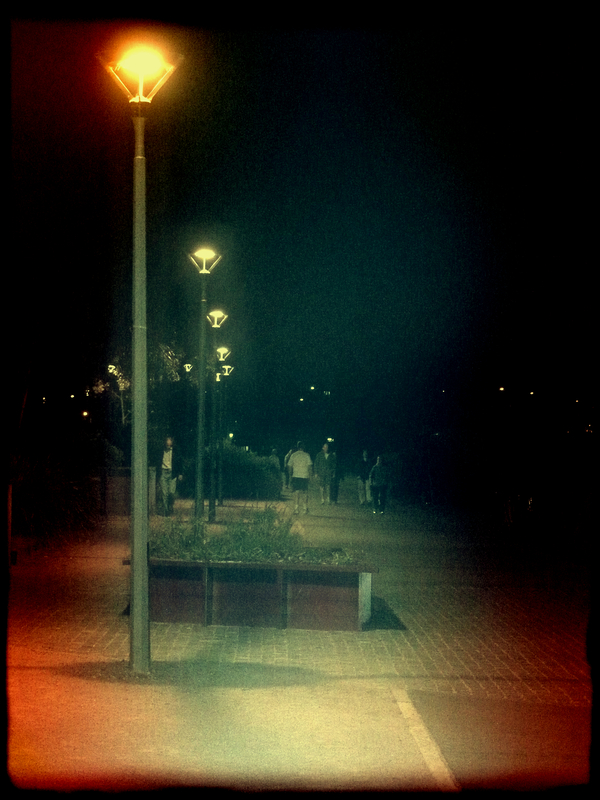 Walking, shuffling, ambling along the promenade at night. They are there but they’re not there, thrown into relief by the lamplight and traffic from the bridge. They don’t walk like the daytrippers. They don’t look at one another. Safe in the shadows, quivering in the amber night lights, afraid that if they are seen they will be banished. It is no surprise they are there. The water draws them, the trees, the bay shaped like a talisman. People have walked there for thousands of years – long before the houses came, long before a bridge linked two sides of the same world, steadying boats made from bark. Did those people from aeons ago feel what we feel, what the ghosts feel? Were they reluctant to leave, held by the land and the sky? If you sit under the fig trees it makes you wonder. If makes your heart fly out like a child reaching for a kite string, conscious of the vast, unexplained glory of the world. Knowing that it is in our bones, the very essence of this earth, this thing we can’t let go of, that makes us move forward and backwards over the same dependable roads; compelling us, whether we be creatures of day or night, to walk. I have the chills from head to toe! Beautiful! As a confirmed night walker and experiencer of ghosts, I love this post. I am so glad you are a night walker too, Jennifer. I absolutely love it. I hope we get the chance to walk at night together sometime! This is very well written Sel. What an interesting topic to ponder. I love the imagery. scarrrrry…. I think about this stuff all the time, Geraldine. You just never know what’s walking around at night – EEEKKK!!! Wow, Selma, I think this is absolutely your best piece of writing from an artistic point of view – crafted extremely well to evoke the eeriness (sp?) of the walkers in the mist. It could so easly be turned into a poem… Lovely! I love the things you write about, added to how beautifully you write, always makes it a joy to read. Awww thanks, Deborah. I love what you write about too. You ALWAYS crack me up. And it is such a treat when you visit! You seem to have a lot of ghosts round your kneck of the woods 🙂 Beautiful writing Selma, as usual – I love fig trees. It’s a ghostly kind of place around here – OOOOOOOOOOHHHHHH!!! Fig trees are just magnificent. At the moment I am attempting to photograph one of the really big ones in the park. It has a spread of about 50 metres. I don’t really have the skills to fit it all in the shot but I am trying. It is a beauty! Jesus Christ Selma!!!!! How do you write so beauifully…..
You are so kind to say that, Childwoman. I do write a lot and I love it. If that comes through in the writing then I am delighted…. My cousin was a police officer, and he often ‘kept an eye on’ people at dead of night, to check they weren’t up to something unlawful. And, he said that for such people to inexpicably disappear wasn’t uncommon. OMG. I wonder where they went. There’s a story there. A lot of policemen have really interesting stories. I love talking to them! Thank you so much, Adventures. I really appreciate the visit!